Proof of the inability of a competent authority to express an opinion is not grounds for return. We use the finest in secure packaging to better protect your items. The item "#UXC1a DEEP RED BUFF FDC BY ARTCRAFT HV2782" is in sale since Friday, August 10, 2012. 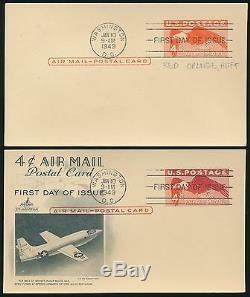 This item is in the category "Stamps\United States\Covers\FDCs (pre-1951)\1941-50".